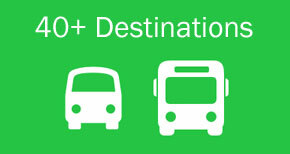 Shuttle service from Stuart to over 40 destinations in Florida including airports and seaports. Florida Shuttle has been serving over 40 cities in the state of Florida. In case you need to travel by using a ground transportation from Stuart to Orlando, Port Canaveral, Cocoa Beach, Vero Beach, Stuart or any major cities we serve in the East Coast of Florida; we are the right choice for your transportation needs. By using our most economical Stuart shuttle bus service you can have option to travel with ease and comfort to anywhere in the state of Florida from the cities we serve in the East Coast (i-95). Affordable and flexible shared ride. Our most flexible Stuart private transportation gives you an option to travel to your desired destination anywhere in Florida. It is a door to door service that gives you an option to choose your own time and place of pick up and drop off. Our Stuart shuttle bus service provides you a ground transportation between Stuart to all the major cities we serve in the East Coast of Florida. There are many other Stuart ground transportation providers departs an hour later or earlier depending on where from they would be picking you up. When using our Stuart shuttle bus service the most commonly used routes that almost every ground transportation provider use is (I-95) OR Florida's Turnpike. Currently, we do not offer door service in Stuart with our shared shuttle bus service. We do not go directly from Stuart to any cities we serve in the West Coast of Florida with our shared shuttle bus service. Our private transportation service offers Stuart transfers to different destinations in the west and east coast of Florida. Stuart FL nearby airports: West Palm Beach International Airport, Orlando international airport, Fort Lauderdale international airport, Miami international airport. The state of Florida is the best place for vacation in USA and is famous all over the world because of the wonderful theme parks, beautiful lakes, eye catching places and of course the soul soothing beaches. Tourists, travelers and also local residents love to visit different places within the state. There are many fun places to visit in Florida. So, if you're planing for a vacation there, we would like you to visit the Stuart Official site and/or take a look at our Travel Blog below for more information. Enjoy and Bon Voyage!